Gold closed last week below $1200 for the first time but has since rebounded from support at $1180. Silver has also rebounded but only after declining in 11 of the past 12 weeks. Precious Metals endured a very rough September and became very oversold. With Gold near its daily low and the gold miners (HUI, GDX) near their December lows, a rebound was probable. Precious metals bulls need to stay patient and disciplined as we believe this is an oversold bounce in a sharp downtrend until proven otherwise. 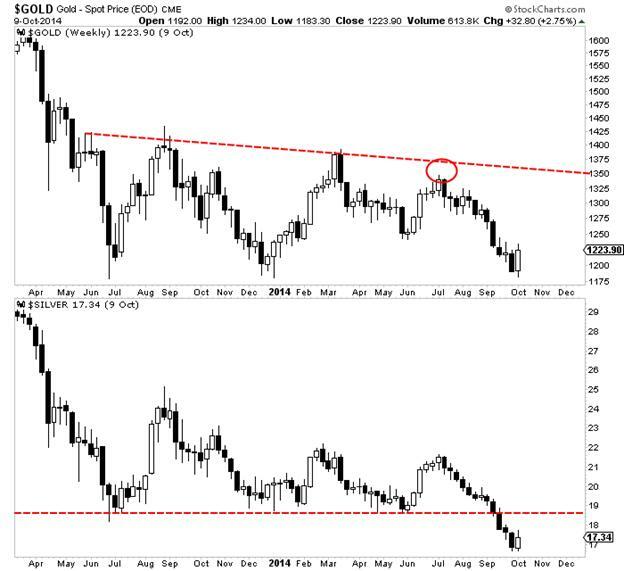 We plot Gold and Silver in the weekly candle chart below. First, we should note that triple bottoms (in the bullish sense) are extremely rare. Gold does not have the look of a triple bottom or reverse head and shoulders pattern. Over the past 15 months Gold has continued to make lower highs. The most recent high (this summer) indicated greater weakness as it reversed course before reaching trendline resistance. Meanwhile, note that Silver recently brokedown from what appeared to be a triple bottom. Silver has declined in 11 of the past 12 weeks. It could rebound back to previous support in the mid $18s before resuming its downtrend. Another reason to be skeptical is Gold and Silver have major, multiyear levels of support below current levels. As we noted last week, Gold has its 50% retracement at $1080 while the monthly charts for both metals illustrate the strength of support below $1100 in Gold and at $15 in Silver. The same can be said for the mining stocks. As we pen this, GDXJ has about 11% downside to its December 2013 low. 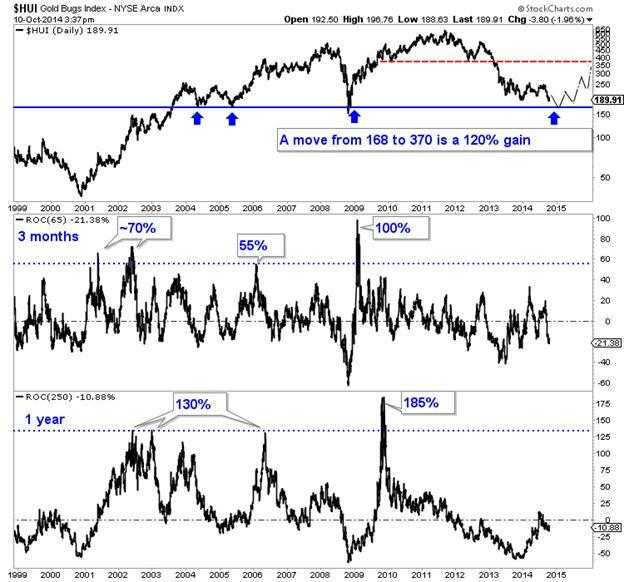 The HUI Gold bugs index has about 12% downside to multiyear support at 168. We also plot the HUI’s rolling rate of change over three months and one year. There is huge upside potential in precious metals but in my view that will come after further downside. I believe we have to be patient and let this bounce take its course before the market embarks on its final decline. I am waiting for the market to test or break downside targets in an oversold state much stronger than at present. I see a potential lifetime buying opportunity emerging in the months ahead. In the meantime, stay solvent and consider learning more about our premium service including a report on our top 5 buys at the coming bottom.